Ungolok: warning for Ink Blast ability doesn't work. Threngar: warning for the Untold Horror (Akvan Monstrosity ability) doesn't work. Pumpkin: Sovereign Fervor timer doesn't reset on P1->P2 transition. Fixed: Incorrect checking flow for version number. New: Added "/kbmdefault RezMaster" slash command to reset the size and position. Note: Use /kbmdefault to get a list of available default options. Fixed tank swap module, stacks and duration of Shadow Glaive should be correctly displayed. Removed warning and mechanic spy for Shadow Glaive. Fixed tank swap module, stacks and duration of Waterlogged should be correctly displayed. Added Timer and warning for Contagion. Added a warning for Building Pressure. Added a warning for Fatal Current. Added Feast of vengeance to ready check. File rearrangement: Rift 1.0 - 1.9 expert dungeons and raids have been grouped in a subdirectory. Sicaron: Change of UTID to mirror the change in game. Murdantix: Added a timer for Demonic Leash cast. Pumpkin: Added timers for Sovereign Fervor and Scrapyard Rumble. It works to modify the raid frame of person who needs to be reflected. Doesn't work with Gadgets Raid Frames or ClickBox Healer. Display correction for Iced interrupt warning. Correction of P3 to P4 transition. Added a timer for Demonic Leash. Fixed a miscoded debuff causing a crash on clients other than French. Added interrupt warning for Frost Bulwark. Added interrupt warning for Iced. Moved the instance from Rift part to Nightmare Tide part. Reset of records for bosses. Grouped boss variables and added comments. Hierarchization of loaded files and variables. Fixed a bug causing addon crash on death of the boss. Corrected the name of the boss. Added tank swap debuff and its translation for french client. Added warning for Tactical anchor cast. Partially added Mount Sharax raid, missing first and third boss. New: Created Nightmare Tide base directory structure. New: Added Nightmare Tide tab to the Instance selector. New: Created Nightmare Tide menu infrastructure (id = NT) for instances. New: Added Drop Down objects. New: Added :SetMinStack(Min_Stacks) command to trigger objects. Buffs/Debuffs with stacks will only trigger with (Min_Stacks) or more. New: If there is a MinStack set for a trigger and a buff returns .stack = nil then the trigger will not fire. New: Added additions to Ready Check created by Ivnadar. Ready Check Update by Kapnia (Rift Forums). New: Feast of the Ghar. New: Templates added by Noshei for The Rhen of Fate. New: Added some bosses supplied by Kapnia for Mount Sharax. New: Added Menu point for Mount Sharax. Change: Reworked some of the Raid/Group handling code and also optimized it a little. Fixed: Error 1280 (nil UnitObj). Now has checking to ensure Object exists. Increased all enrage timers by 2 minutes. Increased all enrage timers by 1 minute. Fixed: Error 1120, which could possibly cause raid tracking issues. Optimized: Reworked raid tracking code to be more streamlined. Changed: Reworked menu code to be better separated from the main code. New: Started work on new Drop Down menu items. New: Added new Drop Down graphics and initial code base. Added: Alert for Drastic Renovations. Change: Changed dance notification to simple say "Change"
PlayerCastbar : Resets the position of the Player Castbar. TargetCastbar : Resets the position of the Target Castbar. FocusCastbar : Resets the position of the Focus Castbar. BossCastbar	: Resets the position of the global Boss Castbars. Castbars	: Resets all of the above. Change: :SetLink(TimerObj) method will now Attach to a Master Timer. This allows for multiple Timers to link to a single Timer. Fixed: Master Timers now apply their settings to all slave timers when they are changed in the menu. This includes enabled and color settings. Fixed: Removed KBM table from Global Namespace. Fixed: Removed KBM_Debug function from Global Namespace. Fixed: Removed TriggerObj from Global Namespace. Fixed: Removed AlertObj from Global Namespace. Fixed: Issues where color changes were not implemented immediately via the menu. Changed: Halved call time for buff handling. Fixed: Added capture for unhandled .Unit fields. New: Castbars added for all Eggtenders. New: Alerts and Timers added for Greater Tectonic Transference. New: Alerts and Timers added for Chain Gang. New: Alert added for Execution. New: Alert added for Rockslide. New: Added Mechanic Spy and Screen Alert for Unstoppable Rampage. New: Glacial Lure and Screen Alert for Glacial Lure. New: Timer added for Energy Beam. New: Timer added for Spine Shatter. New: Timers added for Exitinciton. New: Timers, Mechanic Spy and Alert added for Outbreak. New: Added Alert and Spy for Infernal Burn. New: Added Personal Alert for Infernal Burn. Note: There seems to be some confusion to the new Dance pattern for Isskal. Some are saying there are 2 now, and possibly shorter. Fixed: Drowned Halls Menu Options. New: Added all new marks available with Rift 2.5. Fixed: Issues with Mark sizes and transparency. Fixed: Error 111 when unpinning castbars via the encounter castbar tab while global bars are not visible. Fixed: Error 609 related to Dynamic unit castbar handling. Fixed: Added catch for error 4535 (possibly performance related). Fixed: Error 81 for buff monitoring. New: Added Breaker X-1 "Onyx"
New: Added Enrage timer of 9 minutes. New: Added Tank-Swap for Fission Burst. New: Added Alert and Spy for Ionic Decay. New: Added Alert and Spy for Kinetic Distortion. New: Added Alert for Quantum Disruptor. New: Added Enrage timer of 6 minutes 30 seconds. New: Added Timer and Alert for Sibling Rivalry casts. New: Added Timer and Alert for Ensnaring Creepers. New: Added Timer and Alert for Ravenous Legion. New: Added Template for Volan. New: Added Phase Tracking in Phase Monitor to account for Flames and Blood. Fixed: Error 1304 - Passive castbar creation. Fixed: Error 70 - Player castbar pin scaling. Fixed: Error 621 - For either missing Name or missing object creation. Fixed: Error 1236 - Cast data access error. Change: Now uses new API event system. Fixed: Issues with Raid/Group members being only partially available when first encountered, and being locked out from updating. Change: Prevented Units visible via damage [Idle] from being listed in Target List. Fixed: Partially available units were never registering themselves in the Name Lookup list, and never doing so from that point forward. Change: Tanks are now listed in order of Group/Raid position. Fixed: Error 906 - Menu items without settings tables. Fixed: Error 4134 - Failed boss mod start attempt (forced reset). Note: Using this method will create the Unit if available, or return an existing unit object. Note: The Rift Addon API still doesn't support native Event.Unit.Detail.Relation, so until it does, the above will remain in the standard damage/heal handler. Fixed: Prevented UnitObj.Health sometimes being nil. Fixed: Table entry errors for new units created via Unit.Target. Fixed: Some odd behaviour with cross-shard raid messages. Removed: Redundant raid queue code. Slight performance increase. Optimized: Removed training wheels from the system. Performance boost. Fixed: Graphical glitch with some death states. This should now be more reliable. Fixed: Moved Combat state checking higher in the condition stage to prevent false encounter starts, and Mods locking themselves from starting correctly. Note: Recently I've noticed Mobs and Players having no combat state both in-game and via the Addon API, this was messing with KBM's Encounter validity states. Change: Should a Mod incorrectly attempt a start due to unusual client states, KBM will hard reset the mod preventing it from locking up entirely. Fixed: All custom color settings will now work as intended. It'll remember default colors, and last color chosen when switching to/from custom. Change: Custom colors for objects are applied immediately. Change: Prevented capture method sending nil for Target. Change: Now sends Boss.Name as the Caster field. IMPORTANT: ALL Castbar settings have be reset to default due to how the new system works. New: Engine and Bar for Player castbar. New: Engine and Bar for Target castbar. New: Engine and Bar Player Focus castbar. New: Engine and Bars for all Encounters. New: Global Encounter Castbar settings are just that, regardless of Multi-boss fights. New: Castbar placement is now based on relative screen coordinates rather than absolute. New: Encounter castbars automatically dock to the global anchor and expand outward should more than 1 be casting at a time. Change: Overriding Global Encounter Castbar settings will allow you to disable/enable, pin/unpin and/or scale on a per castbar basis. Change: All cast, channel and interrupt triggers are now handled via the new engines event system. Change: Maximum castbar size has been increased to 200%. Change: Pinned castbars inherit the Global Encounter Castbar settings. Change: Custom castbars retain Style and Texture settings from global settings. These cannot be changed individually. Removed: Old KBM Castbar system has been completely removed freeing up CPU cycles for KBM's main loop. Change: Added a catch for cases when the monitor incorrectly starts and remains visible. New: Added Alert for Baneful Smash. Removed: Cast alert for End of Days. Only Buff purge remains as an alert. Change: Kolmasveli's Hide mechanic is now cyan (light blue) to match his Ire mechanic. Change: Kolmasveli's Ire debuff mechanic spy is now blue. Change: Tempest Flare now defaults to yellow, as it's an interrupt mechanic. New: Updated UTID for Power Conducer. Fixed: Alert Tab not showing. Change: Alert color changed for soul shatter. Now Orange by default. New: Added Mechanic Spy for Curse of Magma. New: Added Enrage Timer for 5:30. Change: Incineration timer changed from a Wait style to standard. New: Added Tank-Swap monitoring for Devil's Pact. New: Added Alert and Spy for Infernal Radiance. Change: Res States will only be checked if a heal of more than 1 is encountered. This should eradicate false res events. Fixed: Error 155 in Kyo encounter. The Event model isn't working as intended. It'll not break, however event removal blocks pass-through to the game world. I'm converting all Frame events to work as it was intended. As soon as Trion fix their end, KBM will work as planned. Change: Renamed some event labels to avoid issues with other addons. 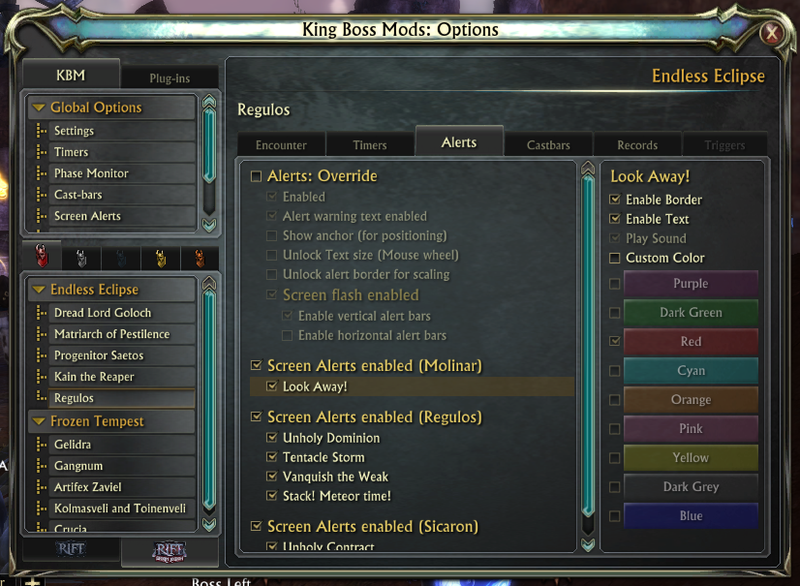 Fixed: All Timer, Alert and Spy options should once again be adjustable without needing to /reloadui or log out/in. Change: Updated to new event model. Fixed: Restored functionality to move the button. Change: Converted Button systems over to new event model. Change: Prevented errors with corrupt or incorrect settings. Fixed: Issues with resizing while Res Frames where active. Fixed: Rare Error 1112. Possibly due to lag. Fixed: Minor memory leak during some target changes. Unknown Side effects, which could possibly cause the above over long periods. Fixed: Accuracy of tracking when units are created via target changes. Changed: Optimized some Raid management code. Note: The above fixes and change should see an improvement on memory management and performance. Fixed: Updated to point to new menu system. Fixed: Settings are applied more reliably upon start-up. New: Added Timer and Alert for Steel Whirl. New: Added Alert for Shock Blast. New: Tracking for Coruscating Powerstone. New: Tracking for Exceptional Whetstone. New: Tracking for Exceptional Oilstone. New: Tracking for Prime Brightsurge Vial. New: Tracking for Prime Powersurge Vial. New: Tracking for Prime Enduring Vial. New: Tracking for Prime Fortified Vial. Fixed: Errors when selecting scaling Options with Castbars. New: Added MechObj:SetSource() if you'd rather display the source of triggers rather than targets. Change: Removed warning message for slow computers. I'll bring it back later as an option for those wanting to monitor performance. New: Encounter victory will now add defeated bosses to the ignore list to prevent re-fires of the encounter. Note: If an encounter states a victory prematurely then type /kbmreset to clear the ignore list. Should be very, very rare, if ever. Change: Entropic Abyss will now only show 1 mechanic spy object. Change: Ebon Eruption spy will now display the channel duration. New: Added an alert for Flash Freeze. New: Added an alert for Stack in mechanic (Frost Bound). Updated French translations for Grim Awakening. Change: Now uses far less memory (around 10Mb+). Complete rewrite of the underlying menu code in preparation for new functionality. At the moment this is just reproducing old functionality. Mark-It and Add-Watch will require updating. Change: Instance Headers and Encounter Files no longer create menu items within their files. New: Timer and Alert added for Delayed Annihilation. New: Spy added for Soul Leech. New: Spy added for Abhorrent Growth. New: Spy added for Phase Rip. New: Spy added for Bone Harvest. New: Timer, Alert and Spy added for Soul Shatter. New: Timer, Alert and Spy added for Gaze. New: Timer and Alert added for Incineration. New: Spy added for Mindsear. Fixed: Issues with Castbar settings causing occasional settings resets. Fixed: Castbars were not saving correctly. Fixed: Sicaron's castbar was not showing. Fixed: Issues with Res messages only being sent to group members, and never to raid members. Fixed: Vanishing player names when coming off cooldown. New: Dead Raid members with battle resses are now displayed with a gray bar. Fixed: Once again tracks Party/Raid group modes correctly. New: Added Mechanic Spy for Foul Blood. Conversion of KBM Core events over to new Rift Event API. New: Added tracking for Stellar Fortified Vial. New: Added tracking for Excellent Fortified Vial. Change: Converted all Events over to the new Rift Event API. New: Can now handle tracking for up to 4 debuffs. Change: "cast", "personalCast", "channel", "personalChannel", "interrupt", "personalInterrupt" changed to ModID-BossName-Trigger format to prevent overwrites. New: Setting a Wait timer will keep the timer in the list (with elapsed time) until the next trigger. Change: Converted to new Rift 2.2 API Event system. Change: Now uses Safes Table Library (LibSata) for all sorting and updating. New: Added Personal alert for Soul Rapture (need confirmation on Debuff name, Hard Mode purple bubble, or Buff ID). Change: Ebon Eruption timers and alerts are now prefix with the corresponding mini. Fixed: Enabled the Percentage Monitor to fire for the final two. New: Added Timer for first Tentacle Storm (minimum). New: Added Alert and Spy for Unholy Dominion. New: Added Alert for Tentacle Storm duration. New: Added Alert for "Look Away" mechanic for Molinar. New: Added Alerts and Spies for Sicaron's bubbles. New: Added Spy for Seething Darkness. New: Added Alert for Excruciating Hex for Sicaron. New: Added Percentage tracking for Amrian on the Phase Monitor (Only during Hard Mode). New: Added Percentage Monitor for tracking 10% difference (Only during Hard Mode). Change: Arc Weld is now flagged as an important Personal Alert. Change: Increased Power Conducer timer by 5 seconds. New: Power Conducer timer will now stop at the start of Phase 2. Change: Removed the timer stops for Glimpse at 10% as they can technically be cast again. Fixed: Elemental Castbar was not remember settings after restarting Rift/KBM. New: Added UTID for this Unit. Change: Now triggers and tracks via Boss UTID. Fixed: Prevented Axis errors with Percentage Monitor free resize. New: You can now scale the Width/Height of the Tank-Swap monitor (Text will adjust to the smallest scale automatically when scaling only one dimension). Change: Now converted over to new Rift 2.2 API Event system. New: Method added Trigger:AddAlertSeq(AlertObj, Player = true/false) - Adds an Alert Object to the Alert sequence list for a created Trigger. New: Method added Trigger:AddTimerSeq(TimerObj) - Adds a Timer Object to the Timer sequence list for a created Trigger. New: Method added Trigger:ResetAlertSeq() - Resets the counter for the Alert sequence position. New: Method added Trigger:ResetSeq() - Resets both Timer and Alert positions. NOTE: "Personal" style casts, channels and interrupts will only trigger if the players current target or focus is the unit in question. New: The menu window will now remember which Rift tab you were last in (Base or Storm Legion). New: When an encounter triggers a victory, all tracked units are entered in to an Ignore List to prevent residual units re-trigger the same encounter. Note: Using /kbmreset will force clear this list in the rare events of false positives. Change: When units enter a Partial state, their Combat flag is forced to false. Change: When units die, their Combat flag is forced to false. Change: Mechanic Timers can now trigger multiple timers at the same time, at any point in its duration. Fixed: Typing /kbmbuffs USERNAME works again. New: Completely redesigned and made to be a module available to any raid encounter. New: The graphics have been overhauled. New: Ability to freely scale the monitor via the mouse wheel, between 50%-150%. New: Option to hide/display Boss names on the monitor. New: Option to hide/display Boss percentages on the monitor (text form). New: Option to hide/display Boss raid marks on the monitor (represented via internal Rift raid marks). Change: Name changed to Res Master. Change: Attempted to solve the "Blue Bar" issue with players with missing callings. New: Added Phase Monitor Percentage tracking for all mini bosses. New: Added Enrage Timer of 7 minutes. New: Added Interrupt Alert and Stop Trigger for Wave of Decay. New: Added the new Percentage Monitor to this encounter. New: Added UTID for Energy Vortex. Fixed: The Energy Vortex should no longer trigger outside of the encounter. New: Added Timers for each Conducer phase. New: Added an Alert for the start of each Conducer phase. New: Added Refactored Construct unit for future tracking. New: Added an Alert for Tempest Fury (Look away mechanic). New: Added Personal Alert and Stop trigger for Shocking Pulse interrupt. New: Added Personal Alert for Lightning Rod. New: Enabled Tank-Swap for Conductive Armor. Removed: Original Percentage Monitor and related code. Changed: Converted completely over to a UTID checking system. Fixed: Added the method GatherRaidInfo again when enabling Rez Master via the options menu. Change: Adjusted enrage timer to 6 minutes. Change: Adjusted enrage timer to 7 minutes. Change: Adjusted enrage timer to 7 mintues. Removed: All related code to unit tracking has been removed and replaced by LibSUnit. Change: All previous Unit Detail lookups and comparisons have been replaced by Events with Unit Objects. Note: This may take some time to iron out any glitches in the system (major overhaul). New: KBM now had the ability to check for a Min version for any Plug-Ins. New: Enrage timer added for 7 minutes. New: Added Alert and Stop trigger for Reconstructive Beam. New: Tank-Swap enabled for both Ire debuffs. New: Enabled new Multi-Tank Aggro feature in Tank-Swap. New: Added Personal Alert and Mechanic Spy for Sparking Eruption. New: Added Alert and Stop Trigger for Energy Vortex casting Tempest Flare. New: Added a Castbar for Energy Vortex. New: Added Unit Tracking for Energy Vortex. Change: This encounter will now correctly trigger a victory only after both bosses have died, not just Kolmasveli. New: Added a persistent Castbar for Toinenveli. New: Phase Tracking for 50%, 30% and 10% added for both bosses. Intiatial system, may be revised. Fixed: Should now return the correct Unit Object during new add spawns. New: Enrage timer added for 13.5 minutes. Fixed: Phase Monitor should now correctly track at least the two active thrones correctly. New: Added 4 additional units for ID capture and encounter launching. Change: Re-ordered Menu items to better portray progress. New: Added Mechanic Spy for Tempest Wrath. New: Added personal Alert for Tempest Wrath debuff. New: Added personal Alert for Move away from the Tempest after debuff drops. New: Added Alert for Blinding Surge. New: Added personal Alert for Arc Weld mechanic. New: Added Mechanic Spy for Arc Weld. New: Added Alert for Energy Conduit cast warning. New: Added Alert for debuff duration of Energy Conduit. New: Added Tank-Swap monitor for both Dissonant Vitality and Energy Conduit. New: Added warning Alert and duration Alert for Ensnaring Jolt. New: Added Tank-Swap monitoring for Mental Anguish. New: Added Alert for Mien of Supremacy purge. After looking through the logs not entirely sure this work first time, it should though. New: The slash command /kbmreset will now provide an Event.KingMolinator.Encounter.End trigger (Type = "reset"). New: Percent style objectives. Added DisplayName field check for bosses with verbose style names. Note: Name should always be the actual Unit name, DisplayName field should be added if you wish this to be something different. New: Added dual Tank-Swap monitoring for Hoarfrost and Voltaic Spasms. New: Added Unit Tracking for Shrouding Vortex. New: Added a Timer for tracking Phase 1 durations, and first Phase 2. New: Added Mechanic Spy for Glacial Rime. New: Added Alert and stop trigger for Cyclonic Destruction interrupt. New: Added Alert and Timer for Lacerating Cascade. New: Added Alert and Stop trigger for Static Empowerment interrupt. New: Added Timers for First and following Void Spawn phases. New: Added Timer, Alert and Stop trigger for Deranging Tempest interrupt. New: Alert for Red Mist cast and channel. New: Added a 25 second timeout in order to catch encounter endings. New: Added a catch for the message announced when completing the encounter as a victory state. Fixed: Both versions of Dominax should now have a castbar again (if enabled). New: Alert added for Frost Bound (Move in mechanic). New: Alert added for Winter's Fury (Hide mechanic). New: Added Alert for Siphoning Vortex. New: Added Stop trigger for Siphoning Vortex successful interrupts. New: Added Vellion's Exposed Viscera as a unit for death tracking, and victory state. New: Translation dictionary for Names. New: Idle states are now refreshed when an unseen unit causes damage, previously only receiving damage would do this. New: Added support for mentoring level adjustments, and level changes. This will also effect KBM:Add-Watch. New: A players recorded level will now update accordingly. Change: Adjusted how and when idle units are checked for damage. Now sent through primary update method. Change: Adjusted how and when idle units are checked for healing. Now sent through primary update method. Change: Removed double calls to the Phase Monitor's update method. Change: Removed duplicate calculations of new percentages. Performance boost. Fixed: Incorrect encounter start UnitID passed when checking for starts via NPC damage source to a raid member. Fixed: Incorrect reference to List, should be Lists. Fixed: Removed incorrect calls to the Phase Monitor's percent based objectives for unseen units. New: Added Tempest Assault Frame unit tracking. New: Added Stormcore Annihilator unit tracking. New: Added a 25 second timeout for P1 to prevent premature endings. Fixed: Corrected name of Encounter. Russian Update for Maelforge encounters. Change: The Phase Monitor has been adjusted to allow for tracking of multiple units with the same name. Change: Phase Monitor linking now occurs when a new Encounter Unit is detected. Note: All relevant data can be extrapolated from the ModObj. Change: Units now attempt to activate as idle regardless of their "seen" state. This includes them doing damage, and receiving indirect AoE. Change: Units in the Idle state "unseen", should now update their HP values based on Heal/Damage/Death events via UID. Note: The above changes directly effect the Plug-in KBM:Add-Watch, and you should now see HP updates for faded (unseen) units in an encounter. Change: Reference Lists for missing UTIDs are compiled fresh each run. New: Add command /kbmability : This will list all abilities available to your character along with their Ability ID. New: UTID updated for Zoles.